Compression pumps are increasingly recognized as an effective treatment for lymphedema. 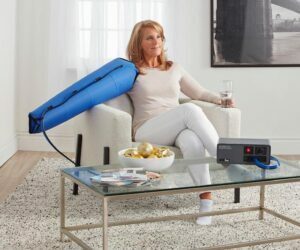 The compression pump system consists of an air pump and a sleeve that fits over the affected extremity. Air pressure is applied to the appliance, which in turn applies pressure to the extremity. A basic pump applies uniform pressure over the entire extremity. The high-quality devices consist of a pump and an appliance with three or more segments that apply sequential pressure along the extremity, distally to proximally (from the hand or foot toward the torso). This type of system creates a gentle massaging action, moving the accumulated fluid from the affected extremities back into the body, where it can be naturally eliminated. Pressure and the subsequent effectiveness of the treatment can be gradually increased as the patient becomes more tolerant. 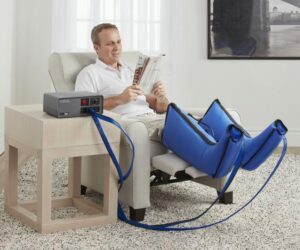 Bio Compression Pumps are lightweight, quiet, comfortable, and easy to use for home therapy. Because of their comfort and ease of use, patient compliance is very high. Gradient pump systems are a cost-effective way to treat lymphedema and venous insufficiency.